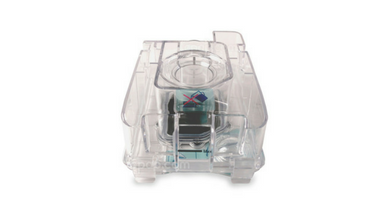 : The Water Chamber for Luna Integrated H60 Heated Humidifier is the replacement chamber used with the H60 Heated Humidifier which is the integrated humidifier for use with the Luna machines by 3B Medical. Please Note: The water chamber is not filled from the top. To refill the water, locate the small dial located on the front corner on the bottom of the chamber.